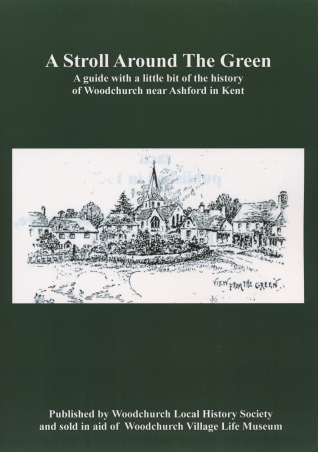 This 17-page A4 booklet with its 22 black-and-white illustrations, a mix of period photographs and superbly detailed pen-and-ink drawings by local artist Gerry Jones, is designed to help you as you take an enjoyable 45-minute walk around Woodchurch village green. A map showing the location of the 33 buildings mentioned is included, so it is possible to take this stroll without actually coming to Woodchurch (although, of course, we recommend you do). The Green has long been the centre of the village and many of Woodchurch's oldest buildings are there. There is not enough space to give a full description and detailed history of each building, the aim is instead to satisfy some of your curiosity and whet your appetite to explore the village further. The author, Jon Chaplin, has lived in one of the houses bordering the Green since 1994. You can also buy A Stroll Around The Green securely using your debit or credit card via PayPal. Simply select your delivery location then click on the Buy Now button.